Rosedale Nantong is located close to the Sutong Bridge, in an area overlapped by the Nantong University City and CBD district, conveniently surrounded by a number of large shopping malls and supermarkets. Rosedale Nantong is the best rated hotel within the range of the Nantong Sports Conference and Exhibition. The expressways have provided an easy access to the city center, which takes approximately an hour’s drive to reach toShanghaiHongqiao Airport and PudongAirport. 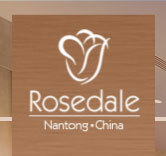 Rosedale Nantong offers 168 elegant rooms and suites, including non-smoking floors and executive suites. Equipped with open kitchen, washing machine,refrigerator, and more, Rosedale Nantong provides an ideal living space for both business travelers and long stay guests. Located on the 3/F, Sonata Western Restaurant can serve up to 150 guests. Carefully decorated in an elegant yet romantic atmosphere, the restaurant offers a variety of dishes from different countries. Located on the 3/F, the Chinese Dining provides a whole new fine dining experience. Our five spacious multipurpose function rooms can cater between 50 to 250 guests, suitable for various meetings and galas. The extravagant Grand Ballroom features crystal chandeliers, million dollar audio systems, projection systems, computerized LCD systems, and a movable stage, surely satisfying your needs and overwhelm your senses. All content © copyright 2011 Rosedale Hotel Group Limited. All rights reserved.